I’ve got to believe at some point in your life, you’ve raised your fist and shouted out in anger at God. Most of us have done it. Maybe your parent died, or you had a friend get seriously sick, or even killed. Maybe you have cancer, or some kind of handicap. These and other serious issues enter our lives, making it easy to target God for our pain. Someone described anger this way: Anger is a human emotional response to situations that are either out of our control or out of our ability to understand, or both. Have you ever wondered why we get so angry at God? That’s what I want to talk about, because I can assure you that while God allows us to cry out to Him, He doesn’t want us stuck in rage towards Him. What are some of reasons why we get mad at God? 1) We don’t get something we want. Have you ever really wanted a relationship with that perfect girl or guy? Or you really wanted that job you knew for certain would be perfect for you? When these things didn’t work out, you no doubt found yourself hurt and disappointed. Our first impulse is almost always to blame God. Daphne wrote: When we get mad at God it is really like a 2-year-old throwing a fit because Mommy or Daddy won’t let them stick their finger in the light socket. The 2-year-old can only see what he/she wants, the parent sees the bigger picture, and the danger. When we are mad at God we show our immaturity, ignorance, and our shortsightedness. 2) We get something we DON’T expect. When something bad happens to someone we love, or to us, or someone gets really sick, or even dies we wonder why these things have to happen. We think of God as a big genie in the sky who should only give us good things and prevent the bad. I received a comment from someone who said: Some people wonder why their lives end up being a certain way, and they blame God for it, because if God really cared for them, then He wouldn’t let them suffer. We think God owes us something. Both of these situations can make a person feel like God doesn’t care about us. After all the prayers we’ve prayed, God still didn’t heal your brother’s cancer, or get you the job you wanted. Joe wrote:I have to admit that I am angry at God. The more I have prayed for help and guidance, the more I get nothing. He is ignoring me. It’s His right to do with me what He will, but I am frustrated because I have done what I think I am supposed to do and yet no response, no help. We get angry when we think God owes us something. When in fact, God owes us nothing. We get angry with God when we don’t know all the facts. It’s so easy to think we know everything, but we can only see a very small part of the picture. We get angry at God when we see others claim to know Him, and then act like hypocrites. It’s easy to blame God for the faults of others. These are just a few reasons why people get angry with God. Of course, there are many more. 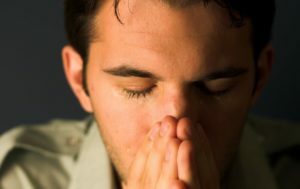 How to get over being mad at God – Know what you can expect from Him. If we think God is going to be our genie in a bottle, and make everything good in our lives, we’re going to be mad at God wh en something bad happens. Having faith in God is not insurance against hardships. His Peace – If we trust in Him and believe in Him we will have peace even in the hard times. Do you want to know how to find this peace? Begin Your Journey To Peace with this great resource from Peace With God. God Wins in the End – This world is full of sin, hate and death and that comes from the enemy, Satan, not from God. However, for all those who believe in Jesus there is glorious, eternal life in heaven. His love – He promises His love for us. 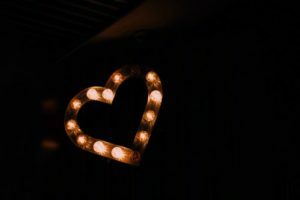 “God is love, and whoever abides in love abides in God, and God abides in him.” (1 John 4:16) He loves your heart and is with you in the midst of whatever your circumstances. Life with greater meaning and significance – If we got everything we thought we wanted, we’d be spoiled and selfish. God is a wise father who knows what we need to become the best men and women we can be. What can you do when you are mad at God? 1) Tell him how you feel. The best thing you can do is tell God what you’re angry about. He wants to hear from you about what you’re thinking and feeling. Tell God honestly where you are at. God knows what’s going on inside of you, but He wants to you be able to come to Him with honesty and openness. 2) Place the blame for evil on Satan not on God. 3) Pray for courage, strength and peace to make it through the day. Betsy wrote: I find it easiest to leave everything in God’s hands and pray that he will care for me and do what’s BEST for me, not what I want, but what is best. It’s very hard, and I have trouble with that at times, but that is my overall goal. 4) Trust that God will use a hardship for something beyond what you can see. So can God use for everything we go through for a greater purpose? I believe He can. Ask God for understanding to see the bigger picture. Over time, you may see more clearly a how God used your trial for good. Jill wrote honestly: I feel like I have a daily tug of war with God. I know everything happens for a reason, but when you’re lonely, broke, bored, and feel helpless, it is really hard to say, okay God, I know you’re doing this for a reason. 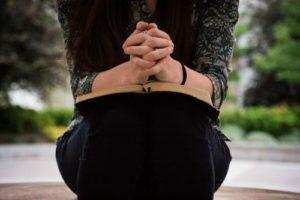 Betsy echoed Jill’s thoughts: After many trials I learned that it is best to accept what God has done and believe that it is for my good, whether I like it or not. Believing He does have a reason for everything we go through helps us to trust that something bigger is going on here, even more than we can probably understand. But I’m not God, He is. And I’m just going to trust that He knows what’s going on with me. 5) Get involved in other people’s lives. A lot of our anger and frustration in life comes from thinking about ourselves too much – we think about the way things are and how different they are from how we wish they’d be. Yevgenia wrote: One of the best things I have learned while going through this is God won’t put you through something unless he knows you will be able to overcome it. Another way I have used these things in a positive way is by using my experiences to help others who are going through similar things in their lives. The best way to find joy and peace from the hardships of life is to get involved in other people’s lives. Take an interest in other people and their circumstances. Share in their joy and their pain. 6) Decide to have a relationship with God. The Bible says the only way to know God is by knowing His son, Jesus. Jesus was basically God with skin-on and gave us a way to know who He is, His love, and how be in relationship with Him. Lucas wrote: Sometimes only God will know why He has allowed a trial and sometimes He will reveal its purpose to us. Sometimes it’s because He is preparing us for a greater thing. Sometimes it is to show to us how little we truly love Him, and to allow us to change. Trials give us an opportunity to build our faith in a way nothing else can. How have you dealt with your own personal anger toward God? I’d love to hear from you. Please let me know how you got over being upset with God. Do you have questions about who God is? 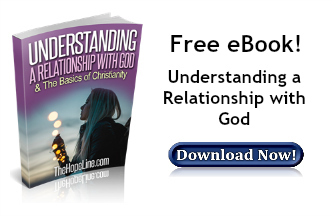 Check out TheHopeLine’s free eBook: Understanding a Relationship with God. I hope you are still out there. Your only 20. Just a kid starting life, maybe the reason you’re not playing pro soccer is because you are to teach your love of the game to others. Maybe become a coach. There are tons of people who may need you to show them how to play and share your passion for the game. If you are still thinking of suicide, get help. Go to your local hospital. Suicide is never the answer to a frustrating situation. My husband killed himself when he was 27, left me with two babies to raise by myself. Think about your family when you have suicidal thoughts. Because, you might get relief from your pain, but you will absolutely destroy them. Its been 16 years this year since my husband took his life. His children never knew him. He took that chance away from them. He shattered my heart into billions of pieces. And i still have a hole in my heart for him and i always will. He didn’t consider me or our kids or his mom, dad, brothers, best friends. The people who loved him. Please seek help! I don’t know how to start. After I graduated from University I promised God that I’m going to serve Him. I agreed to marry to a person who is 10 years older than me, poor, not well educated just because he was a pastor. Before I get married, I fasted and prayed that God make our marriage if he is the right person. When I got married I lived the hardest life ever with him. I was physically and emotionally abused by him. I found out that he is one of the most selfish people I’ve ever known. I used to ask God why did that happened to me. He was so stingy that we use not to have enough food. I had many questions to God. There are many other things that I prayed and fasted for and were not answered. I don’t know why. I really don’t know what to do with my life anymore besides giving up and killing myself. I’ve been chasing my dream to play pro soccer since 6th grade. I’ve been working hard saving up for many pro tryouts only to see myself fail and fail. I’m 19 turning 20 in May. I’ve always been talented in sports yet it doesn’t seem like God is using my gifts at all. Like I’m talented for no reason. Why doesn’t he help me live my dreams? Am I just born on this earth to just live a regular 9-5 job? I’m tired of this pain. Since it gave me depression seing myself fail and fail, I have no energy to do much. I’m running out of options. I want to just die, I’m such a loser and a failure. A waste of talent…..God seems so cruel for letting so much pain and tears in my life. Crying for help praying everyday reading his word doesn’t WORK!!!!! !IM TIRED OF THIS!!! WHERE IS GOD!!!! I cant help but to be so angry and question God! Why me???? I dont seel drugs I dont do anything bad yet theres people who are criminals and succeed……why doesn’t he help his own children? God is supposed to be a good father? Yet I’m depressed and crying everyday?? Nobody understands my pain…..
Caesar, We understand and want you to know that you are not a failure. We commend you on your hard work and your dedication to stay on the right path. It is hard to understand why things happen the way they happen. Why our dreams do not happen. You are grieving and hurt that your dream to play pro soccer is not happening. Grief takes on many emotions. Anger, depression and frustration are part of the grief you are experiencing. It will take time for you to understand that amazing things are in store for you. The hurt is too strong, right now for you to see this. Please do not give up. Please take the time to see what happens. Please know that this is not God’s fault. God is love and He loves you just the way you are. You are wonderfully and beautifully made in His eyes. He still has great plans for you. They may not be your plans, however, they are His plans. Your anger with God is part of your grief. Now is the time to reach out to Him. Take time to read His word and have quiet time with Him. Open your heart to experience His deep love for you. We know great things are in store for you. 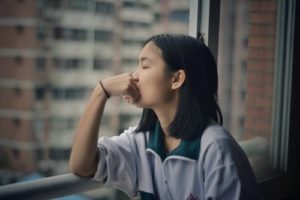 This is a good blog to read: https://www.thehopeline.com/why-do-bad-things-happen/ And please stay and know you are not alone — and there is help for people who are feeling suicidal. You can call the National Suicide Prevention Lifeline at 1-800-273-8255 or text “START” to 741-741. Head here for a list of crisis centers around the world. Your still VERY YOUNG! I played soccer and even traveled to England to play. I gave it up in high school to play football. I wanted to be pro kicker in the NFL. I was offered a tryout with the Carolina Panthers. After months of training and not hanging with my friends, I get to the tryout and they already signed a kicker. They didn’t even call me to save me a trip! I kept trying until I got hurt soo bad, I had to give up playing. My injuries were soo bad. I was really angry to. What I realized later (and you will to) was that my playing got me into the front office side as I worked with the San Diego Chargers and then with NFL Films in Super Bowl 37. I was on the sidelines at the Super Bowl and getting paid! God had another plan for me. I didn’t like it or understand it at first but it did become clear as I matured. Keep trying and keep practicing. Ask God for guidance along the way. Maybe you will end up coaching or working for a team some day. Don’t give up but keep an open mind. What took me forever to finally understand was that I was not good enough at kicker. But I still was involved in football and at the highest level! My wife lost out to cancer aged just 54 years. We stood on the Word and Gods promises, knowing our place in Christ and dealing with any blockages such as unforgivness. I honestly feel betrayed by a God who I thought was concerned , and promises healing. Angry and betrayed! God kept his word. Your wife is no longer suffering. And if she was a believer in Jesus Christ and was saved according to the Holy Bible, she will be at peace. The hard part is for you to live without her. The only way to do that is with Jesus, the Holy Bible and a support group. Hang in there. I too am mad @ God and yet I KNOW Him, I don’t just believe because I was raised that way, I have been physically touched (& I mean in a visceral way) I have seen His miracle with my husband’s cancer. After my husband passed away ALL of my prayers and conversations with God were centered on my 3 children. My oldest son & his wife (in their 50’s) are now full time parents to 4(age 2 to 11) grandchildren, they need His strength, guidance, and health to finish this journey. My daughter who suffers from competing health issues, pancreatic blockage, resulting in 50% removal, eventual burn out & now Type 1 diabetic plus hemochromatosis and has been giving when she had nothing to give to others with her time, her home, her food, her clothing and all she wants is some PEACE with her second husband who is now a statistic oxycotin addict from a back injury. She can only do so much heavy lifting in her marriage and she has prayed as have I and there is no end in sight and she can not hold on much longer…..WHERE IS GOD right now, where is He? I don’t have the answers, but I care for you and I truly understand how you feel. I have known our God for over two decades and I have felt forsaken by him for much of that time. Even though I know not to trust my feelings, the pain is still real and sometimes it screams so loud that I lose my grip on the truth and I slip and fall. We both know all the pat answers: “we have the hope of eternal life in Heaven”, “it’ll all work together for our good”, “we need to be thankful for the blessings we have”, yadda yadda yadda…. Biochemistry and astrophysics have always fascinated me. The way the electrons of an atom swirl around the nucleus at nearly the speed of light, the way the gravity exerted by the sheer mass of the sun holds the Earth in a perfect balance with its centrifugal force as we revolve around the sun. The examples are endless. His intelligence is demonstrated from the most infinitesimal subatomic particle, all the way up to the vast, immeasurable expanse of the entire universe. This is God’s answer to our great father of the faith- Job, who is our example of perseverance in the midst of great suffering and injustice. Dear sister, I pray that the glory of His infinite wisdom and understanding would shine through everything you see, everywhere you go, both for you, your daughter, and her husband who needs hope too in the midst of his opiate dependency and back pain. I love you sister, and I hope my words encourage you not to lose heart, though the suffering is long and your heart aches with waves of grief that only God knows. There is a song that touches my heart deeply by Michael Card called “The Silence of God”. Another one is “You’re gonna be okay” sung by Jenn Johnson of Bethel Music. I hope you listen to these beautiful songs and are encouraged. I look forward to hugging you in Heaven as we enjoy our reward. I believe in God, in Jesus but I’m honestly mad or disappointed at them, right now. I have played by the rules; I have tried my best to live and do as He commands. No, I’m not perfect but I remember His words when I feel like “not being good”. I put my other cheek, I forgive as many times as Jesus would have to, I always ask, what would Jesus do? And try to do as He did. But I feel that my prayers are unheard. I feel there’s no sense in talking to Him if He’s not willing to listen. I know He’s no genie. I know it’s His will, not ours.., but where is the peace of His presence in our lives, in our families? What I ask of Him is so small, compared to his magnificence. I feel I need a timeout but I still fear to offend Him.